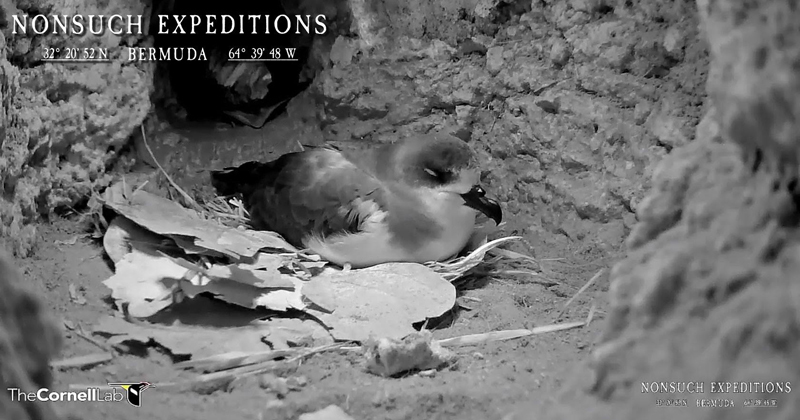 Several days ahead of schedule the egg in burrow #831 on Nonsuch Island from which the CahowCam has been live streaming for the past five nesting seasons is in the middle of the hatching process, the team at Nonsuch Island announced today. During a routine nest check yesterday Chief Terrestrial Conservation Officer Jeremy Madeiros observed that the egg had “dimple cracks” half way round the large end of the egg with a very active chick inside. Jeremy Madeiros said, “The 2018 Cahow breeding season continues to provide surprises, with all indications pointing towards another record-breaking year. A new record number of 124 breeding pairs [those laying an egg, whether it hatches or not] has been confirmed, compared to 117 pairs in 2017. “Normally, almost all eggs hatch in early to mid-March, with only a few early chicks hatching in late February, but as of 28th Feb this year, 16 chicks have already hatched, 5 of which are on Nonsuch island. “During a check of the “CahowCam” nest, R831 on Nonsuch yesterday, it was confirmed that the female adult [band no. E0212] was incubating the egg after taking over incubation duties from the male bird on the 19th February. “It was also confirmed that the egg was in the early stages of hatching, with the chick actively moving in the egg and having produced a number of “dimple cracks” half-way around the large end of the egg. Once these cracks extend around the entire large end, the chick can then start working on kicking this out and hatching. Nonsuch Expeditions Team Leader J-P Rouja said, “We have just replaced the camera housing which had become scratched in the underground chamber and now have an even sharper image. “The livestream is being watched in realtime via the CahowCam homepage www.Nonsuchisland.com by the general public and by the local and international schools that have been following us. “Classrooms can stream the video through to their whiteboards and if timing works out as it has in past years, their students may be watching when the final hatching event occurs.